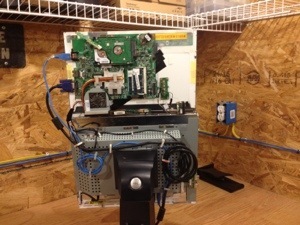 I am converting an old Compaq Laptop and A Dell Flat-Screen Desktop Monitor into an All-In-One computer with one power supply and dual Displays. I took the display panel off the rear mount, and behind it there is just enough space to mount the power supply for the laptop motherboard. 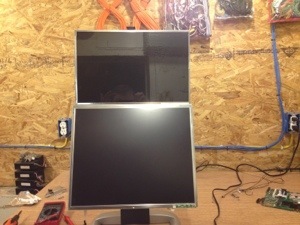 And here I tied the power input to the same input the monitor shares. 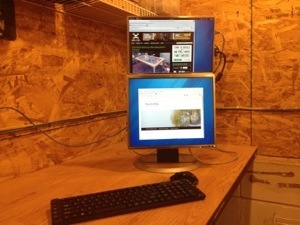 Here is the first bench-test connected to the lower display. 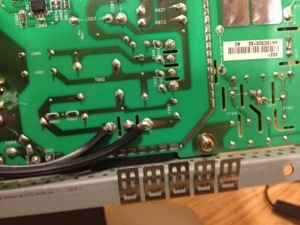 Here is the notebook motherboard mounted to the back of the display and many of the connections routed. It is aliiiiiiive!!!! 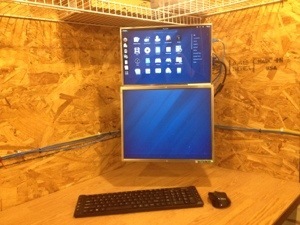 Booted into Fedora 18 with both displays active. 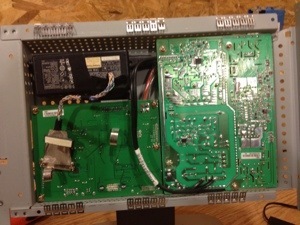 Here is a better picture of the rear, showing how I routed all the data and power lines. Working, mounted to the wall, and ready for action!!! Hi there. 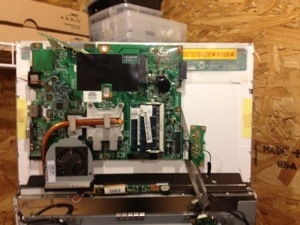 I was curious how you mounted the laptop innards to the laptop screen? It looks very minimal and I have been contemplating this for a while. Thanks! I debated and tried several ways before settling on adhesive Velcro patches. I bought them from a craft store, they are pretty thick and I used about 5 of them between the base of the motherboard and the back of the screen. Works really well and I can detach the motherboard if I need to do any repairs, by gently prying it away and separating the Velcro. Be careful not to get the super strong Velcro, that might be too hard to get them to release. I have had this running 24/7 for about 2 weeks now and haven’t had any problems. Thanks, Ezra! I might be starting this project this weekend! Thanks for the inspiration. I love how you matched the witdths of the screens – I’m guessing that it’s a 15.4 inch laptop and 17 inch desktop screen, right? If so, then you have a perfect resolution match, 1280 pixels for both. I’m a bit pessimistic about that velcro though – while it might hold even in 24/7 scenario, the heat from the laptop might affect the panel and eventually you might get some color differences in areas where the temps are higher. Most builds I’ve seen have some spacing between panel and hardware. I personally went with the flat layout – hardware below screen in the same plane, panel above the desk line, hardware below it. Other than that – grats, it’s very impressive, especially with no cables around! Thank you for the complement, it wasn’t really meant to last for a very long time, but it has held up well. I mostly just use it to keep a market (forex) view up It is controlled by a mouse that is shared (using synergy) from another computer. do you have any pictures of your setup? I would be interested. Sorry for the delay, the wonders of the filtered inbox kept me from seeing the message about your reply.